Want to make something from 2×4 wood? These boards make great DIY projects (mostly furniture). 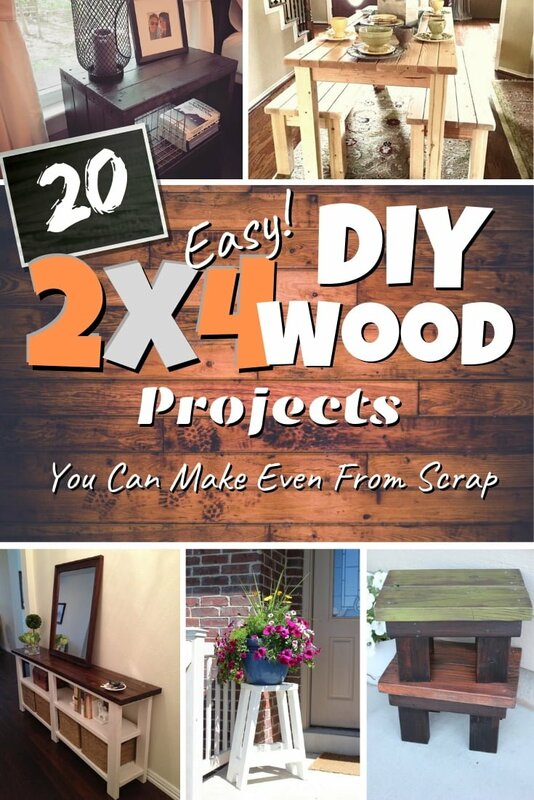 Here are 20 easy DIY 2×4 wood projects. It’s amazing how many cool things you can make from 2×4 wood. It’s the practical shape of this type of wood that makes it easy to use in almost any kind of DIY furniture. Be it a small table or a stool, a bench or a storage rack; it’s always easier to build something using 2×4’s. So if you’re up for a simple project, we have a whole bunch of them here. These are some of our favorite DIY pieces that you can build from 2×4 wood. Check them out! There is nothing cooler than a barstool, especially when you have a single kitchen bar. Sure, you can go out and search for barstools, but these are likely going to be expensive. It is wiser to break out the tools and get a few 2x4s to get the job done. The barstools will stand at 26 1/2″, and that is an acceptable height. 2x4s are pretty versatile and can do almost anything with a little imagination, including this small DIY bench that can be used to give a child a place to put shoes. Those who want a clean look and feel should consider using a good pocket hole system along with some wood glue to get the job done. The coffee table has always been the centerpiece of a living room, and it only makes sense for you to build a DIY coffee table yourself. You already have the tools, and now you need to get the 2x4s to get the job done. Consider the colors you are going to use, and make sure it is a color that will match many settings just in case there are furniture or carpet changes at some point. It is essential to be unique, and you can use today’s look on your next project. Again, using a few 2x4s, you can make a beautiful whitewash farmhouse coffee table. You are going to need a piece of glass to fit the table and complete the look. Functional, cheap, easy, and inviting are some of the characteristics that this table embodies. The top of the table has small gaps to give the table room to breath, and all it needs is a few 2x4s along with some of your tools. It can be perfect for your patio or in your home. There are a few things you need in the morning, including an alarm clock or your smartphone charger to charge your phone. A good DIY nightstand like this one can come in handy. You already have the tools, and you know you have the skills to get this done in no time. You can build a DIY headboard to go with your nightstand as well. One of the easiest ways to make an attractive coffee table is to incorporate a mirror. Reflection always gives a piece an ethereal feel, and cutting a mirror to fit your coffee table should not be too hard. Besides, the likelihood of having a few extra mirrors at home is high, so re-purposing one of them is a good idea. Face it; you probably don’t want to bend down to care for a plant. It should be a little closer to you. This little problem can be solved if you have a builder’s heart and a few 2x4s. Making your very own plant stand gives your plant a place to shine, and it does not take too long to complete. 2x4s are pretty standard, and you probably have a few scraps laying around your workshop. It is hard to find a purpose for these pieces at times, but why not create a scrap flag out of these pieces? It shows patriotism (perfect for July 4th decoration), and it is also eco-friendly since every piece of wood was used. Children will outgrow the crib at some point, but cribs made out of wood can still be useful. All you need to do is mix those pieces of wood with some 2x4s to create this great small sofa sectional for the kid’s room. Be sure to find plushy cushions when you are done though. The oversized and chunky look has been making waves for some time, making this design pretty timely. To add more flair, you can also add firewood coasters. Be sure to let the tabletop shine with a finished wood look. The job does not take too long, and the outcome is excellent. One area of the home that could get boring are the walls. This is mostly because walls are generally bare, but that no longer has to be the case as long as you have your 2x4s. A few metal pieces and some rustic wood pieces should make this wall decor pop and revitalize your walls. By looking at this attractive and practical DIY kitchen island, you would never believe that it only costs $30 to build. Despite its inexpensive cost, this island is a great choice and can add beauty and space to any kitchen, so why not add it to yours? For an extra cute and comfortable bench add upholstery. Not only will this upholstered X bench serve as a comfortable resting place, the addition of upholstery means you can customize the pattern and colors for any space in your home. This X bench makes a great accent piece in any room. You can craft a great DIY coffee mug rack that has plenty of room to hold your entire collection. For this project, you can use pallet wood or 2×4 boards. Here’s a DIY project for a cheap small table for your porch or backyard. And it doesn’t have to be limited to the use outside – add more interest to your decor by using it inside. Being creative means, you can save a lot of work, such as using just a bunch of 2×4’s to create this whimsical coffee table.